Toyota is gaining significant sales gains even with a lot of negative press about its many recalls. The plan, since last month, is to offer deep discounts that are unheard from Toyota. In fact, for years Toyota has benefited from high resell values because they haven’t had to offer deep new car discounts that do cause residual values to fall and drop prices in the used market which has given Toyota a nice advantage against the Big Three American companies -- Chrysler is still American, right? – that could have long term impacts. This of course all depends on how long Toyota will have to offer big discounts to curb the recall sales fallout. 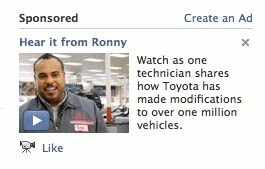 Right now Toyota is reaching its loyal owners through a rather large media buy on Facebook with a video ad that has ran almost two months solid featuring Ronny, a Toyota technician, who communicates how the brand is responding to consumers going through the recall. 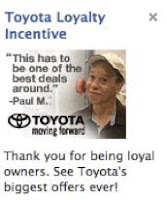 More importantly, Toyota is running several loyalty ads informing owners of “Toyota’s biggest offers ever!” with the ad headline reading “Toyota Loyalty” or “Toyota Loyalty Incentive”. The ads are not about adding Facebook fans. 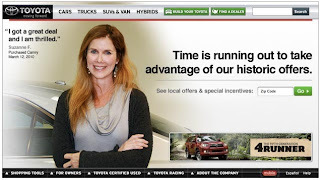 The ads bring users to the Toyota website where there is a landing page communicating the local offers and special incentives available at this “historic” time. The discounts are helping as Reuters is reporting today that sales are up 35% over last year for Toyota. Toyota's focus on loyal customers is part of their strategy since new buyers may be a difficult sale in the wake of recalls. As James Lentz, president of Toyota Motor Sales USA, said March 30, "Our challenge down the road is going to be with conquest buyers," said at a conference cosponsored by the National Automobile Dealers Association and consulting firm IHS Global Insight.